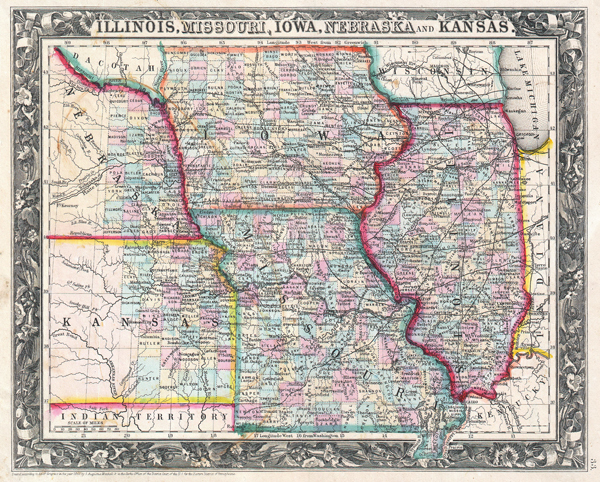 Illinois, Missouri, Iowa, Nebraska and Kansas. Mitchell's new general atlas, containing maps of the various countries of the World, plans of cities, etc., (1860 edition). Very good condition. Blank on verso. Minor discoloration near Nebraska. Rumsey 0565.023. Phillips (Atlas) 831.33. Wichita State University Libraries, 1860-0003.